MADISON – Boxwood blight, a serious fungal disease that attacks a popular garden shrub, has been found in Wisconsin for the first time at a nursery grower in Kenosha County, the Wisconsin Department of Agriculture, Trade and Consumer Protection announced today. Department nursery inspectors found it during a routine annual inspection and sent samples for laboratory testing. 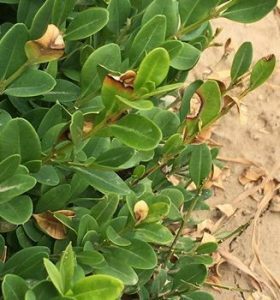 The USDA Animal and Plant Health Inspection Service confirmed July 19 that the samples carried a fungus that causes boxwood blight. This fungus can also infect Pachysandra. Boxwood and Pachysandra are common in home and public gardens. Boxwood is used for hedges and foundation plantings, and in holiday decorations. Pachysandra is a groundcover. The fungus causes brown spots on the plant’s leaves. The spots enlarge until they merge and the leaves drop off. Black lesions also form on the plant’s woody stems. It thrives in warm, humid conditions. It is most often spread by moving infected plants, but may also be carried on garden tools, clothing, and vehicles. Even when infected plants are removed, reproductive spores may remain in the soil for up to 6 years. While fungicides may help prevent the disease, they cannot cure it. Once infected, plants and leaf litter must be burned, buried at least 2 feet deep, or double-bagged and landfilled. Buy plants from reputable suppliers, nurseries or garden centers, and carefully inspect them. Buy less susceptible varieties. A list is available on the DATCP website:https://datcp.wi.gov/Pages/Programs_Services/BoxwoodBlight.aspx. Isolate new plants from existing boxwood/pachysandra plantings for at least a month. Avoid overhead watering, and avoid working with plants when they are wet. Rake and remove leaf debris, and inspect boxwood plants frequently. Boxwood blight first appeared in the mid-1990s in the United Kingdom and has now spread throughout Europe. It first appeared in the United States in 2011 and has now spread to more than 2 dozen states. It is unknown how it was introduced to Wisconsin.